A cairn is a man-made pile of rocks, used by hikers to indicate the path to be followed. The piles vary in shape depending on the rocks in the area. Hikers passing by can add new rocks on top of the pile, as a sign of respect to thank nature, but also to mark their passage. This cairn of Parisian artist Donald Abad (1978), who traded his atelier for working outside combining nature with digital media, embodies the passing by of many hikers. 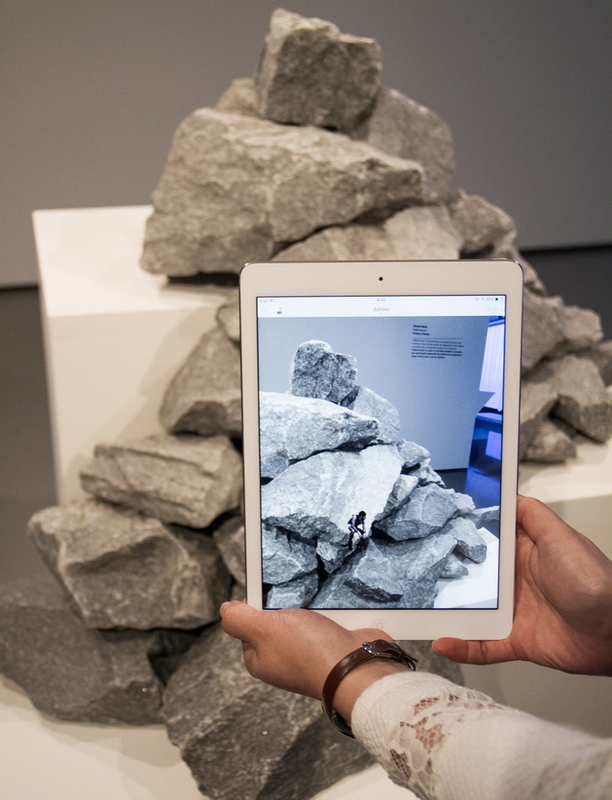 By looking at the cairn through a tablet or a smartphone, visitors can reveal the presence of one of them, virtually linked to the rocks. Mixing land-art, performance, and psycho-geography, Donald Abad’s installation reveals the memory of what is inanimate. Thanks to: STRP Festival, Valentina Zajackowski, Géraldine Taillandier, Clémentine Trey, Olivier Delporte, Sophie Varin, Nicolas Chaverou, Akatre studio, Cyriac Allard and Sophie Menoux. Donald Abad, born in 1978, spent all his youth and scholarship (ENSAD Paris) in Paris. After several artistic residencies and outdoor creations (The Netherlands, Japan, Cyprus, Canada,…) he decided to leave the atelier to work outside and combine media with nature through adventurous concepts or performances.